Clinical and pathological characteristics are still considered prognostic markers in metastatic non-small-cell lung cancer (NSCLC) patients but they cannot explain all interindividual variability. 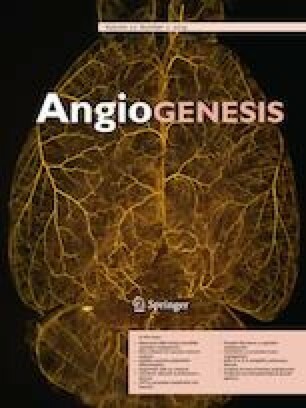 Tumoral angiogenesis mediated by the vascular endothelial growth factor (VEGF) is critical for the progression and metastasis of the disease. We aimed to investigate the prognostic role of genetic variants within the VEGF pathway in patients with metastatic NSCLC. We prospectively included 170 patients with metastatic NSCLC treated with first-line platinum-based chemotherapy. A comprehensive panel of single-nucleotide polymorphisms (SNPs) in genes belonging to the VEGF pathway (VEGFA, VEGFR1/FLT1, VEGFR2/KDR, GRB2, ITGAV, KISS1, KRAS, PRKCE, HIF1α, MAP2K4, MAP2K6, and MAPK11) were genotyped in blood DNA samples. SNPs were evaluated for association with overall survival (OS) and progression-free survival (PFS). In multivariate analyses adjusted for patient characteristics, we found that VEGFA rs2010963 and VEGFR2 rs2071559 were significantly associated with OS [Hazard Ratio (HR) 0.7 (0.5–0.9); p = 0.026 and HR 1.5 (1.1–2.3); p = 0.025, respectively]. Additionally, ITGAV rs35251833 and MAPK11 rs2076139 were significantly associated with PFS [HR 2.5 (1.4–4.3; p = 0.002 and HR 0.6 (0.5–0.9); p = 0.013, respectively]. Our findings reinforce the potential clinical value of germline variants in VEGFA and VEGFR2 and show for the first time variants in ITGAV and MAPK11 as promising prognostic markers in metastatic NSCLC patients receiving platinum-based chemotherapy. The online version of this article ( https://doi.org/10.1007/s10456-019-09668-y) contains supplementary material, which is available to authorized users. Ivana Sullivan and Pau Riera contributed equally to this study. This research did not receive any specific grant from funding agencies in the public, commercial, or not-for-profit sectors. We thank Carolyn Newey for language editing.